I have been a member for over 30 years now. I served for several years a secretary, in those days I was in charge of fundraising as well as organising the committee and all the correspondence!! Nowadays these jobs are shared out more, easier life maybe? Being married to the fundraising coordinator I don’t think so! There is a tremendous sense of achievement when you realise that you have helped a patient’s stay in hospital in a small way be more comfortable by enjoying yourself playing records! But that is not all I do. In my spare time, I like to shoot arrows at the weekend. As a member of the Paddock Wood Archery Club I use my bow and arrows to try to score as many golds (that’s the centre or bullseye,) as I can and improve my score. This is a hobby I enjoy very much – another sense of achievement when all golds are scored. What next, Oh yeah, I run a Brownie Pack. I am Brown Owl except I am called Barney (Barn Owl,) don’t ask, long story. The girls are aged between 7 and 11 and we enjoy all aspects that Girl guiding offers – friendship learning new skills, thinking of others, the world, our god, Queen and country, learning to respect others and the world. Lessons that everyone would benefit from in this day and age. We have fun any enjoyment playing games and doing craft, learning new skills and generally enjoying everyone’s company. Achievement all round!! I try to play badminton with three friends too, although we perhaps talk as much as we play! 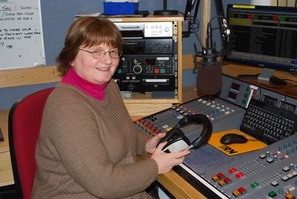 I am a relief presenter on Hospital Radio Maidstone and can be found on the airwaves as and when I am needed.